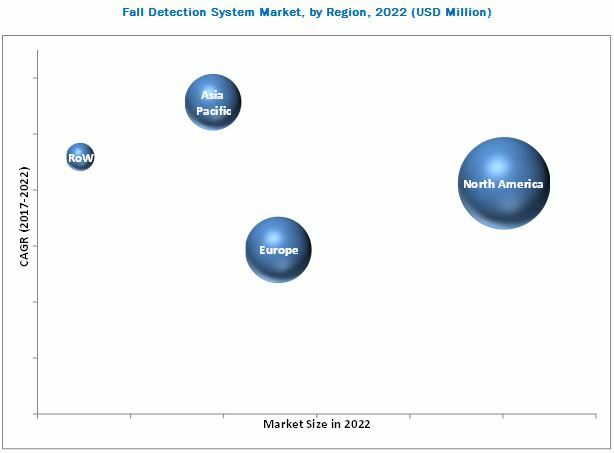 [154 Pages Report] The overall fall detection system market was valued at USD 358.6 Million in 2016 and is expected to reach USD 497.3 Million by 2022, at a CAGR of 5.58% between 2017 and 2022. This report provides the market size and growth potential of the fall detection system market across different segments such as component, algorithm, system, end user, and geography. The study identifies and analyzes the market dynamics such as drivers, restraints, opportunities, and industry-specific challenges for the market. It also profiles the key players operating in the fall detection system market. Factors such as the increasing geriatric population and the adoption of machine learning approach for detecting fall are expected to propel the growth of the overall market. The base year considered for the study is 2016, and the market size forecast is provided for the period between 2017 and 2022. The research methodology used to estimate and forecast the fall detection system market begins with capturing data on key vendor revenues through secondary research. The secondary sources include US National Library of Medicine Association, International Journal of Telemedicine and Applications; annual reports, press releases, investor presentations of companies; white papers, journals, and certified publications; and articles from recognized authors, websites, directories, and databases, among others. The vendor offerings have also been taken into consideration to determine the market segmentation. The bottom-up procedure has been employed to arrive at the size of the overall market from the revenue of the key players in the market. After arriving at the overall market size, the total market has been split into several segments and subsegments, which have been verified through primary research by conducting extensive interviews with key industry experts such as CEOs, VPs, directors, and executives. The data triangulation and market breakdown procedures have been employed to complete the overall market engineering process and arrive at the exact statistics for all segments and subsegments. The breakdown of the profiles of primary respondents is depicted in the figure below. The fall detection system ecosystem includes research and development (R&D) phase, followed by manufacturing and assembly, distribution, marketing and sales, and post-sales services. Koninklijke Philips N.V. (Netherlands), Tunstall Healthcare Group Ltd. (UK), The ADT Corporation (US), Singapore Technologies Electronics Limited (Singapore), and Semtech Corporation (Netherlands) are involved in the manufacturing and assembly of the fall detection system market. These companies further sell these systems either directly to the end users or to suppliers such as Connect America (US), Medical Guardian LLC (US), and Bay Alarm Medical (US). The fall detection system market has been covered in detail in this report. To provide a holistic picture, the current market demand and forecasts have also been included in the report. According to the forecast provided by MarketsandMarkets, the overall fall detection system market was valued at USD 358.6 Million in 2016 and is expected to reach USD 497.3 Million by 2022, at a CAGR of 5.58% between 2017 and 2022. The growth of this market is driven by the availability of better accessibility to assistance in case of fall leading to reduced medical expenses, increasing demand for smartphone and wearable technology, and increasing demand for multimodal technology. This report segments the fall detection system market on the basis of component, algorithm, system, end user, and geography. Accelerometers & gyroscopes led the market in 2016. Machine learning methods is the fastest-growing algorithm owing to the fact that machine learning method increases the robustness, sensitivity, and specificity of the fall detection system. Considering the market segmented on the basis of end user, senior citizens home end user held the largest size of the fall detection system market in 2016, while the market for hospitals, nursing, and senior assisted living facilities end users is likely to grow at the highest rate during the forecast period. Wearable system is expected to hold the largest size of the fall detection system market during the forecast period. This is because wearable systems can be used in homes as well as outside. Furthermore, the availability of devices pre-installed with the machine learning algorithm is expected to be a major driver for the growth of the wearable systems segment. Also, wearable systems are preferred owing to their advantage of cost-efficiency and easy installation. North America held the largest share of the fall detection system market in 2016. Asia Pacific is expected to be the fastest-growing market mainly because of technological innovations and the growing penetration of personal emergency response systems in the country. Along with this, the increasing geriatric population will also act as a key driver for the growth of the fall detection system market. The major restraints for the companies in the market are the low practicality and acceptability of the technology among elders, and use of data from simulated conditions for designing the fall detection system algorithm. The major vendors in the fall detection system market include Koninklijke Philips N.V. (Netherlands), Connect America (US), The ADT Corporation (US), Tunstall Healthcare Group Ltd. (UK), Medical Guardian LLC (US), Bay Alarm Medical (US), Singapore Technologies Electronics Limited (Singapore), MobileHelp (US), MariGroup Oy (Finland), Mytrex, Inc. dba Rescue Alert (US), Semtech Corporation (Netherlands), AlertOne Services, LLC (US), and LifeFone (US). These players adopted various strategies such as new product developments; mergers and acquisitions; partnerships, agreements, and collaborations to cater to the needs of customers. 13.5 Tunstall Healthcare Group Ltd.